Long ago, during one of our visits to Hampi, we were fortunate to visit the pre-historic site of Anegundi (Koppal district), Karnataka. 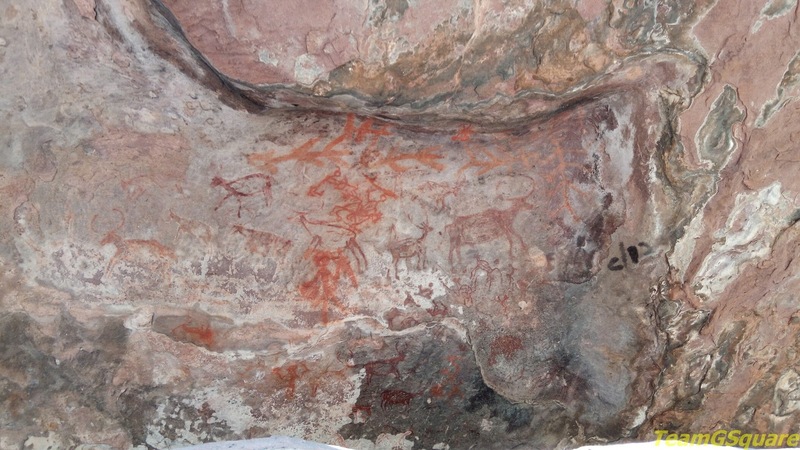 Ever since then, our interest with regards to pre-historic cave paintings only grew and any search relevant to pre-historic cave paintings in India would lead us first to the site of Bhimbetka in Madhya Pradesh. 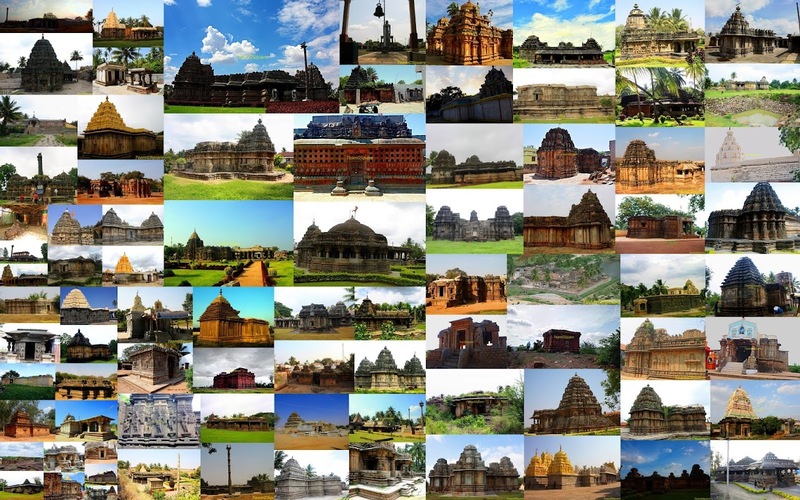 Though visiting Bhimbetka did not happen too soon, we have had a chance to visit many such interesting sites in Karnataka. Bhimbetka is India's most renowned pre-historic site and unlike other sites across India, this place has been very well documented and studied even today. Bhimbetka is the largest pre-historic site in India and the only such to have been inscribed on the list of UNESCO world heritage sites. This place was under continuous human occupation from lower Paleolithic period till the early 19th century AD. On the 29th of December 2016, we drove down from Mandu to Bhopal, via Indore and Dewas. A good six hour drive brought to us Bhopal. It was around 2 am and our hunt for accommodation at this hour brought us to Hotel Midland. After a hard bargain, we negotiated a good deal and settled down for the night. We woke up considerably late the next morning after getting the much needed rest. We were ready to hit the road again after a quick Poha and Sev for breakfast. In an hour we reached Midway Retreat, located 3 km away from Bhimbetka. A cup of hot tea was only thing in between us and the cave paintings. The book of Bhimbetka-World Heritage Series quotes, "Bhimbetka's uniqueness lies not only in the concentration of its antiquity and art, and the wealth that it conceals, but that it has not remained frozen in time and space. Elements of this continuity are manifest in the creative expressions that show affinity to great antiquity in the traditional lifestyles of the adivasis of the area integral to Bhimbetka and the surrounding region". There are over 1400 rock shelters here, of which about 700 carry cave paintings, while only 15 among them are open to the public. The rest are located inside the Ratapani Wildlife Sanctuary. The 15 rock shelters are prefect representatives of Bhimbetka. Rock Shelter No.1 - This shelter has a few paintings mostly of historic period. 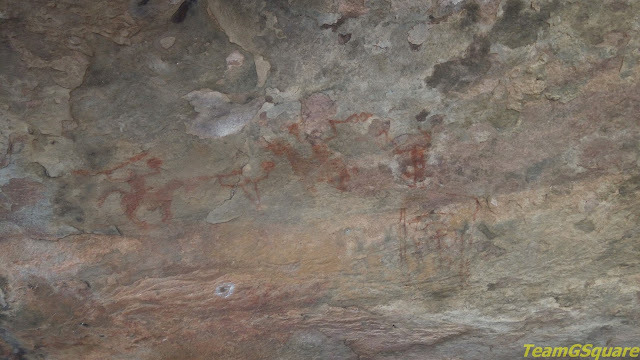 Here we can see the paintings of two elephants and a bull, wounded by the arrow of a hunter. 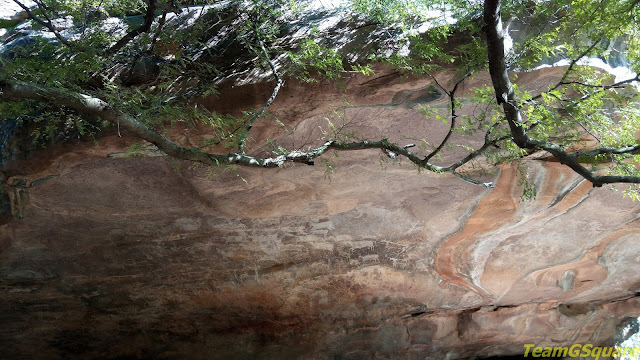 Rock Shelter No.3 - This cave is also called as the 'auditorium cave' due to this long shape. This shelter has paintings of bull, buffaloes, deer, peacock, left hand print of a child and many such. There are many cupules (depressions) on stone, probably associated with Paleolithic period. Rock Shelter No.4 - This shelter is known as the 'zoo rock' and is the most important rock shelter here. There are 453 figures here, comprising of 252 animals of 16 species. The paintings here belong to the Mesolithic, Chalcolithic and historic periods. There are as many as ten layers of super-imposed paintings which is a unique and the most important feature of this cave. Rock Shelter No.6 - This shelter contains beautifully depicted, natural looking animal drawings, group of dancers, drummers and horse riders in white color. An interesting drawing is that of a group of dancers in a line, shown with interlocking hands. Rock Shelter No.7 - This shelter contains paintings of horse riders and a row of deers in stylized form, belonging to historic period. Rock Shelter No.8 - This is one of the important shelters here and the only one comprising drawings of scorpions, fowls and other insects. This is a two storeyed cave with paintings all across its ceilings. There is a scene depicting seven cavaliers accompanied by three foot soldiers, a horse, an old woman, a panther, a jungle fowl, two chicks and insects. Other paintings here exhibit various scenes of hunting, dancing, and other daily rituals. Rock Shelter No.9 - The only shelter here having paintings depicted in green and yellow colors. Most of the paintings here belong historic period. There are paintings of a horse, an elephant and a flower pot. Rock Shelter Nos.2,5,10 - These shelters carry only one painting each. Rock Shelter No.11 - The paintings of this shelter depict scenes from war, most of them showing men on horses carrying swords or spades. Rock Shelter No.12 - This is another interesting shelter with an attractive composition of 38 animals drawn, along with various other paintings. Rock Shelter No.13 - There are a few paintings here depicting humans engrossed in there daily activities. Rock Shelter No.14 - There are few paintings of animals, the most beautiful of them is that of a horse painted in white and decorated with a honeycombed pattern. Rock Shelter No.15 - This shelter is also called as the 'boar rock' due to the presence of a huge painting of a mythical boar like animal chasing a human. Apart from this, many other animals and humans are depicted in the shelter here. Entrance Fee: Rs.50/- per head for Indian Citizens and Rs.200/- per head for others. Rs.250/- for car entry including parking. Distance from nearby major town: 45 km from Bhopal. Accommodation: The only option for accommodation at Bhimbetka is Midway Retreat maintained by MPSTDC. A better idea would be to plan for an overnight stay at Bhopal. Where to eat: Midway Retreat is the only closest option here for food and drinks. There are a few eateries after we reach the highway which is about 4 km from Bhimbetka rock shelter. Carry enough water as there are no facilities for the same once you enter the rock shelter. 1. Bhimbetka - World Heritage Series by ASI. Amazing...A must go place for art lover like me. It is interesting just to observe how art has evolved. There are so many paintings there. Seems like people who drew them just painted them as they saw things in real time! Their paintwork is excellent, I love that. The paintings here are delight to the eyes. Such a helpful post. Nicely covered. Hello Yogi..Bhimbetka is 45 km from Bhopal.